Im not the sneakerhead I used to be when I was younger. I last thing I copped is a pair of Converse *hangs head in shame* Anyway, I remember in 06/07 days EVERYONE was hooked on Vans. Me being me, didnt jump on the wave. I liked them on other people but I was happy rocking my Converse and around those times, my wardrobe become a bit more 'girlier' so there was no need for trainers. 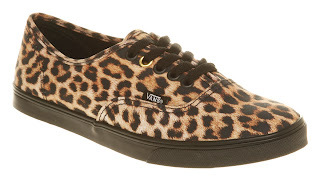 Right so I was browsing around on Office, and low and behold I found myself looking at Vans. Now I may be incredibly late *shrugs* BUT these leopard print Vans *love eyes* I FRIGGIN HEART EM. Then as I flick my eyes over to size selection box and I saw 'OUT OF STOCK'. *Cries* What a sheg! I was pretty VEX. I may settle for the navy or green ones *sigh*. If you got any suggestions on sneakers I should get, holla.